In order to answer you as many questions as possible, even before your stay, we have summarized the most frequently asked questions for you. If you have any further questions, please do not hesitate to contact us at office (at) freshsurf.de and we will answer them promptly. Thank you! Is there any specific arrival day and are there fixed starting days for the surf course? No. You can arrive on any day from Monday to Sunday and start the surf course on any day (except Sundays). We normally plan your first surfing day for the day after your arrival if you don’t tell us otherwise in your booking. What is the average age of the FreshSurf Surfcamp guests? Are there a lot of single travelers at FreshSurf? We often have single travelers, so our accommodations are all close to the surf school. This way you can hang out with the other guests more easily after your surf lesson. Our Surfhouse and Surfvilla are both a shared home so people from all over the world, single travelers or groups, can stay and live together. Which countries are the FreshSurf guests coming from? Most of our guests are from Germany, Austria, Switzerland, the UK, Scandinavia and the Netherlands. Of course, we do have other visitors as well every now and then. Do you need a socket adapter? That depends: the sockets are designed for the European plug – the same socket as in Germany, Austria and Switzerland. If you are from the UK, you will need an adapter which you can also get in our general store around the corner. Statistically, Fuerteventura has a rain probability of 5 days per year, even though according to experience it definitely rains a few days more :). The highest rainfall is in November, January and February. The coldest month is February. In February, the weather is around 20 degrees during the day and 15 degrees at night, which is similar to Germany in April / May. In the summer, the constant trade wind from the northeast bring constant temperatures at 25 to 28 degrees. The warmest days are in the late spring and early autumn, when the wind sets, then the temperatures rise up to 30 degrees, proving that Fuerteventura is indeed Africa. How warm is the water on Fuerteventura? The water temperature varies between 18 degrees in winter and up to 24 degrees in summer. What else can you do on Fuerteventura apart from surfing? Fuerteventura is a paradise for water sports and outdoor activities. Besides surfing you can go kite surfing, windsurfing, stand up paddling, sailing, wakeboarding, waterskiing, diving, snorkeling, quad and motocross touring, hiking, mountain biking, jogging, fishing, playing tennis, football and basketball and much more. But get some inspiration on our activities page. When is the best time to party in Fuerteventura? During peak season in summer, Christmas, New Year and Easter. Also in February / March when there’s Carnival on the island. In El Cotillo it is usually a bit quieter. If you want to go out and party, we recommend Corralejo. How does a booking process? Bookings can be made online, through our booking form, by email, by telephone or via Skype. Is it possible to book surf lessons without accommodation or || only || accommodation without surf course?? Of course! You can also visit our surf courses without booking any accommodation with us. Prices for our surf courses can be found on the website under Surf lessons. On the other hand you can also stay with us without taking part in a surf course (except surfhouse and surfvilla, there is the participation in the surf course obligatory). You will find other options with the prices on our homepage under Accommodation. Catering: What about breakfast, half board and full board? You can find out which catering services the individual accommodations offer on their respective page. The apartments are basically self-catering; In the hotels, there is an option to can board or it is already included. In the surfhouse, breakfast and dinner are already included in the price. In our Surfvilla breakfast, as well as tea, coffee, small snacks and fresh fruit are served throughout the day. Unfortunately there is not the possibility to cook, since the kitchen is reserved for the staff. Bookings for an extension week (short term)? If we still have free capacity in the courses or the accommodation, we are happy if you want to extend your stay Especially in the high season, however, this can be difficult. The best is already renting a car online from home in advance of your holidays. There are many cheap providers which can be found easily through different comparison portals. On the island itself, there is also the possibility to rent cars: at the airport, in Corralejo or even in El Cotillo. After your landing, you can pick up your keys at the respective car hire desk and then head out to us. In El Cotillo there is also car hire at the Cotillo Beach Hotel called Coticar – this is however somewhat more expensive and should rather be considered for spontaneous day trips or short term rentals. Sure, feel free to visit us with several people. Please ask for availability by email in advance. You can cancel directly by email. In this case, please let us know the the booking data and reference number. You will find detailed information on cancellation fees in our terms and conditions. Can you send me a brochure or catalog? We do not want to give up the environment to raw materials. That’s why you can find all the information online. If something is missing, just send us an e-mail! Is credit card payment possible? Since we do not offer this service at the moment, we would ask you to pay your rest amount in cash on the day of arrival or at the latest on the first day of the surf course. After the booking, a deposit of 60% of the total amount is to be paid within 5 days. Please pay the balance in cash in our surf school after your arrival in El Cotillo. If you don’t feel safe carrying cash on your trip, there’s an ATM close to our surf school. If the withdrawal costs of the local banks for the remaining amount are too expensive, we take these for you. Thank you so much! Can you book flights directly from your site? No, we can not book a flight directly. However, we are happy to provide you with information about good online travel agencies or other booking portals in which you can make cheap flight reservations. Which airlines fly to Fuerteventura? There are different airlines flying to Fuerteventura, e.g. Air Berlin, TuiFly, Iberia, Ryan Air, LTU, EasyJet or Spain Air. From Switzerland, you can go by Edelweiss, from Austria it’s Nicki. Another possibility is the flight to Lanzarote – from there you can take a ferry to Fuerteventura, taking 35 minutes. Where can I book best flights? It is worthwhile to look for special offers at an early stage. Condor regularly offers “one-day flights” which are cheaper than their regular fairs. It is also worth checking out large flight travel portals, such as www.skyscanner.com, as it compares prices and suggest you the cheapest. A good advice from us: If you are a little flexible with the date of your holidays, don’t settle on a specific day. Flight prices vary drastically during a week, depending on the week days. The cheapest flights are often the flights, which start very early, for example at 6 o’clock in the morning. When / How long in advance is it best to book the flight? Since the best seats are the ones sold first, the earlier the better. Lastminute offers are rare nowadays. In addition, there are always cheap offers and promotions, for example “one-day flights” at Condor or special Canary Island-offers from TuiFly. By the way, flights during off-season are lot cheaper too. I would like to take my surfboard to Fuerteventura. Is is possible? Of course! You have to register the board or your boards as sports luggage with the respective airline. For the transfer from the airport to El Cotillo you need a rental car or a taxi, which can be parked directly on site – the shuttle can not bring surfboards unfortunately. Advice from us: Ask for the price at the airlines first. Some are taking your boards for free, others charge board fees up to 100 €, making a board rental the better option. In which months / seasons are the cheapest flights available? The cheapest flights are usually available in the off-season, for example outside the school holidays. 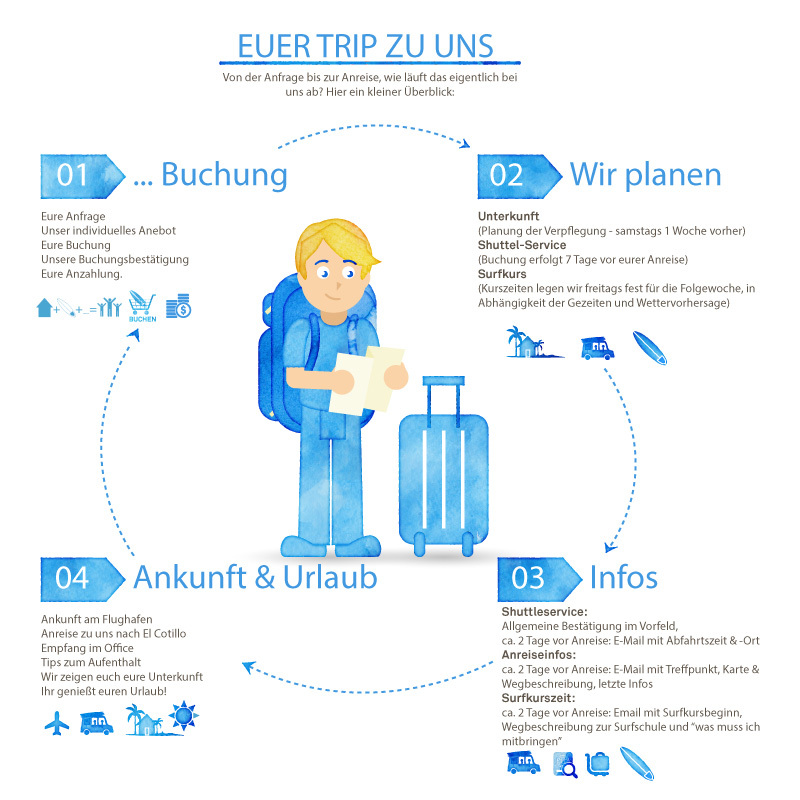 Tip: There are school holidays in your country at the time of the trip and the flight is expensive? Book the flight from an airport in a close country without holidays, i.e. it can be chaper to fly from the Netherlands when you are german and the way over is not too far. What documents do I need to take with me to Fuerteventura? A valid ID card, a certificate of your foreign health insurance or your European health insurance card is all you need. Coming from outside of the EU? You’ll need a passport to travel to the Canary Islands. For visitors from Russia, you’ll also need a visum. In advance of your stay with us, we will send you a health questionare and a registration form via Email. This is requiered for your first surf lesson, so please either bring it with you on your arrival day or send a scanned version back to us via Email before. Which entry requirements should be observed? In principle, European citizens in the United Europe (Schengen Europe) can enter Fuerteventura without restriction. Nevertheless, we would like to point out that there may be different entry requirements for non-Europeans variing from country to country. In order to avoid any unexpected restrictions, we would ask you to inform yourself in advance about the currently valid transit and entry regulations. Airport Shuttle: When is the bus leaving? Mondays to Sundays, the shuttle bus will pick you up from the airport and take you to El Cotillo as soon as you have landed. Back in El Cotillo (at the Cotillo Beach Hotel), you will be picked up in time so that you are going to be at the airport about 2 hours before departure. We will inform you about the appropriate times by e-mail in advance or here on the spot. Airport Shuttle: How much luggage can I take? Since the storage space is also limited in the shuttle bus, we can only carry one suitcase OR a travel bag as well as one hand luggage per guest. Your luggage is not insured yet! In order to be on the safe side, you should book a travel insurance. Are there any (good) restaurants in El Cotillo? Plenty! El Cotillo has numerous restaurants for all sorts of culinary experiences – a few selected ones can be found in our restaurant guide. What are the opening hours of the surf school? FreshSurf is open from Monday to Saturday, daily from 9am – 2pm and from 5pm – 6pm, on Sunday our surf school & surf shop is closed. Can I bring my own gear (surfboard, wetsuit, etc.)? You can bring your own material and use it. If you are having a surf lesson, you can rent the Surfboard and Wetsuit for the entire day for free. Otherwise, the rental starts from 10 euros per 24 hours – you can find more information here: Board Rental. What kind of boards can you rent? Longboard, Shortboard or Fish? Apart from beginner boards (softboards & Mini Malibus), we also have a range of long- and funboards, hybrids and shortboards. This way, you got a big quiver to try different shapes and sizes. If, contrary to expectations, it does not exist, there are several shops in the vicinity, where you will definitely find the right board for you. All about the board rental can be found here: Board Rental. What kind of wetsuits do you provide? With a selection of more than 80 longsuits we have the right one for everyone. Our kids brand is Tiki, the adults are dressed by Rip Curl, O’Neill and XCEL. The thickness is 3/2 – perfect for the water temperatures on Fuerteventura. Is it possible to receive individual lessons or private coaching? Of course, we also offer private coachings. We can specifically address your strengths and weaknesses – strengthen the strengths and mitigate the weaknesses. You can find out more about the operation and the prices of our Private Coaching here: Surf Coaching. Can you really be sure that you are learning to surf at FreshSurf? Let’s be honest: There is no surfing guarantee. Never, no where. Surfing is one of the most difficult sports, demanding seldomly used muscle groups and balance – some stand up on their first wave (especially children), while others may take longer. However, what we guarantee to you, besides a lot of motivation from us make you succeed, is the best possible training by licensed instructors, high quality gear and suitable wind and wave conditions. Where do the surf lessons take part? All surf courses, whether beginner, advanced or intermediate, take place on one of the several beach- and reefbreaks of Fuerteventura. For every surfing session, we check the forecast in advance, looking for the best possible wave and wind conditions each day. Accordingly, we bring you to the surfspot, which is best suited for your surflevel and the conditions. For our beginners, we always start at one of the beautiful beachbreaks of Fuerteventura, preferably our home beach in El Cotillo, so that you can start in the hip-high water on sand soil, with a great beach atmosphere. Is the surf course taking place at a beach or reef break? This depends entirely on your surf level. Concerning safety, our beginners’ courses are only held at beachbreaks. For advanced lessons it depends on the wave conditions where we head. Fuerteventura offers great beach- and reefbreaks for advanced surfers. What do I need for the surf course? Beach- or Swimwear, bathing suit / shorts / bikini for underneath your wetsuit, a towel, suncream (at least SPF 30), a bottle of water, a small snack and above all a lot of good mood! How long is the surf course? One surf lesson lasts approximately 3.5 hours, including theory, practice time and transfer to the spot. In which language is the surf course held? Is the spot transfer included in the surf rate? Yes, there and back again. I have already completed a beginner's course, is there an advanced surfcourse? We offer various advanced surf courses: a course for experiened beginners, an advanced course and private coachings for intermediate surfers. The Intemediate course (on the beach) is for surfers who have already completed a beginner’s surf course and now want to learn how to surf in green waves. This course usually takes place on the beach, where there is still some improvement in the standing up and paddling technique in the white water. The Advanced Intemediate course (on the reef) is for surfers who are already surfing in green waves and want to optimize their techniques and want to work on their timing and positioning in the water. This course usually takes place on the reef. Our Private Coaching (Advanced Surf Course) is for already good surfers who would like to optimize individual movements (eg timing, positioning, certain turns, rail-to-rail-surfing, etc.) and receive individual feedback. A detailed description of the various surf course levels can be found on our website under Surf Lessons. When is the best time for a beginner's surfcourse? Since we go to the surfing beach, which has the best conditions for beginners every day, every season at Fuerteventura is especially well suited to start with surfing. When is the best time for advanced surf lessons? Every season at Fuerteventura is suitable for advanced surf lessons as we choose to best working spot for your surf level every day. If you have been surfing for a longer time and want to improve in a greater swell, the best time is from October to April when the winter stoms hit the atlantic. When can I find the best surf conditions on Fuerteventura? There are (almost) always good waves on Fuerteventura – this is the advantage of an island. If the Swell comes from the north, the Northshore works great, if it comes from the east the east coast works, etc. There are different spots for each season, depending on the swell direction. If you want to surf the reefbreaks of Fuerteventura, the best time is from October to April. In the summer it is generally a little smaller, mostly having wind swell from Africa. From what age can children participate in the surf course? We teach children from 8 years on. In order for children to be safely teached, the surfing lessons need to be prepared even more carefully, and more staff is needed, so we do not grant children a discount. Can you use the surfing material after the course times? On the days you have a surf lesson the material (Surfboard and Wetsuit) is included for the whole day – so you can always borrow equipment from us and go surfing on your own. Can I go surfing on my own? Sure, if you feel confident enough and want to practice on your own, you can rent a surfboard and a wetsuit in our surf school and go alone. The Cotillo Beach is just a 7 minute walk away. What does the rental of surf equipment cost? If you aren’t taking surf lessons, the rent of board and suit individually costs 10 € per day and together as a package 15 € per day. Please do not forget to bring us a deposit (ID, driving license, etc. ), which will of course be handed out upon delivery of the material. Are there cooking facilities in the accommodations? There are several shared kitchens in our surfhouse. All our apartments have their own fully equipped kitchen. In our surfvilla there is no option to cook, since the kitchen is reserved for the staff. Are there shared bathrooms in the accomondations? In all our apartments and hotels there is at least one private bathroom with shower and toilet, which of course you do not have to share. Also in our surfvilla each room has its own bathroom with shower and toilet. The surfhouse consists of 3 apartments with 2-3 rooms, each sharing one bathroom. Do I have to bring sheets and towels? All our accommodations have towels and linens included. If you want an additional towel for the beach, we would ask you to bring your own or buy one in one of the Shops. Are the double rooms mixed? Our rooms in the surfhouse are usually mixed. If you do not want this, please book a single room or give your request in the comment box during your booking. Are there any Internet access points in the accommodation? The surfhouse has WiFi, just like most of our accommodations. Please think of your own laptop, tablet or smartphone. The cleaning of the accommodation is included in the price. There are no additional costs for cleaning or final cleaning. The exception is Casa Solero – there is a charge for the final cleaning. Near to all accommodation (max. 5 minutes on foot) there are different supermarkets. Are there restaurants near the accommodation? Close to all accommodations (a maximum of 5 min. walk) there are many different restaurants. You can read more about this in our restaurant guide. What is the cost of food on Fuerteventura? The prices are normal for Spain or compared to Germany. In comparison to the UK, it’s even cheaper. Certain things like fresh bread from the baker are even significantly cheaper. There are also some inexpensive and delicious restaurants around. Can you borrow bicycles, longboards and skateboards on site? Yes, at the surf school you can borrow sports equipment for the beach and longboards or skateboards free of charge. Bicycles can be rented from the bike rental around the corner. Where does yoga take place? Yoga lessons take place in our personal yogastudio, right next to the surf school. They are supervised by a professional yoga teacher, Erika. The schedule is determined on the spot in consultation with the surf courses, normally taking place in the morning or evenings. You can find more information about Yoga here. What's the cost for a Yoga session? A Yoga lesson costs 15 € for 75 minutes. You can pay this directly at our surf school or book in advance via our booking form. Where is the free diving taking place? Meeting point is the Freediving School in Lajares where you’ll have the introduction. From there, you will be taken by airboat to the diving spots around the island. That’s where the most beautiful underwater world in the north of Fuerteventura can be seen. We’ll provide you more information about how to get to the free diving school, your times and dates in advance in our surf school. You can find more information about diving on our free diving page. Where is the skateboarding taking place? Carver classes will be held by our skate coach Jordi either in La Oliva, in a skate bowl, or on the sports field in El Cotillo, depending on your level. The Longboard Masterclass by European Champion Carl Fölster takes places on the Mosaik Plaza in El Cotillo (beginner’s class) or in the skatepark in Corralejo (Miniramp Advanced Coaching). Is there a possibility for an online cooperation (Blog or Backlinks)? Of course, Freshsurf is very welcome to be included as a link on your homepage. Just send us a short info, where we will appear. If you would like to be included in our link-section, please send us a short information about the page and the link of the page. We are also happy about any blogs that you would like to write about us, maybe to share the experience of your surf holidays with us. If you think that your project might be interesting for our guests, please send us some information via Email – maybe we can introduce you in a blog! I have a project that I would like to push. Do you write about it in your blog? We are happy to support any surf, sea and environmental issues ! Just send us an email with information about your project / film / band / … and we’ll see if it fits. Basically, we always look forward to great material! Do you also offer jobs in your surfcamp? We always have vacancies in our team! You can find free jobs online on our job overview. You have another idea how you can support us? Maybe you have the talent and the time to help keeping our surfhouse in perfect conditions, make a film about us, to blog or want to offer your other exciting talents. It could be exactly what we always needed (and never knew we did) – just write us an Email to office (at) freshsurf.de.